Which game series burned you out? Our personal choices include Far Cry to King's Quest. Tell us yours. In this week's PCG Q&A, we're exploring which series you've just had enough of playing. In some cases, burning out on a series can be a result of the fact that successful properties will seemingly run forever, past the point where we can still enjoy them, combined with our changing tastes and habits as years go by. Below, you'll find the answers of the PC Gamer team, and below that, we'd love to read your answers in the comments. To reiterate, then: which game series burned you out? My little brother plays a ton of Call of Duty, and he's not bothered one bit by the lack of a campaign in Black Ops 4, which confirms we're from completely different generations of player. Battle royale and zombie modes are enough to make him drop money on the game, but for me the campaign was always my first stop in CoD. During the Infinity Ward days they were particularly strong, to the point where I replayed CoD 2's campaign multiple times. They were my gateway to the multiplayer. After Modern Warfare 3, though, the series just tired me out on all levels, and the campaign for Black Ops 2 wasn't terribly exciting based on my time with the first few missions. I'd probably just been playing them for too long, and felt like I'd seen all of the tricks a CoD campaign could possibly show me. The first season of Telltale's Walking Dead is one of my favorite games, and I loved the second season too. Its finale didn't quite have the same impact as the climax of the original, but what could equal that? Together they add up to one of the most atmospheric takes on the zombie apocalypse in videogames, and it's not like we're short on those. Then the Michonne spin-off happened, and it felt like a tiring restatement of the same formula. I still like the way Telltale structure stories—Batman was a real return to form—but Michonne reduced those Big Decision Moments to predictable cliches more thoroughly than any of their games bar maybe Minecraft: Story Mode. It put me off so much I haven't played New Frontier at all. Maybe I'll come back for the final season? I burned out on Far Cry. 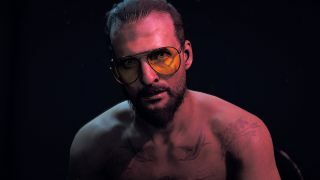 I thought Far Cry 3 was great, partly because I'll play any game with a good bow in it, but mainly because despite having the worst name, backstory and appearance of any protagonist ever, Jason Brody was a really interesting character. This was also back when Ubisoft's now well-worn open-world formula still felt relatively fresh, so I spent a lot of time just exploring the Rook Islands. I'd have to reinstall it to be sure, but I think I finished everything apart from those stupid, tiny collectibles. Then Far Cry 4 came out, and while it felt better to play, it also felt pretty familiar and I thought the environments and characters were worse, and from there it was just downhill for me. I don't what it would take to get me back into the series, but I can tell you it's not cavemen and it's not Montana. I burned out on Just Cause. I really, really loved the chaos and destruction of Just Cause 1 and 2 but it tended to be a bit mindless—which is great! There are plenty of times I want to unplug my brain and just blow stuff up for a while, and those games are a beautiful canvas for that kind of freeform mayhem. After a while, though, I guess it's just not enough to engage me. When Just Cause 3 rolled around and looked like it would be more of the same, I just didn't bite. I know I probably would have enjoyed it for a few hours, but couldn't imagine I'd really get deep into it. Since Austin beat me to the punch on Far Cry (do yourself a favor—play 1, 2, Blood Dragon, and then call it quits while you're still having fun) I'll go back a little further in time to King's Quest. I loved the first three King's Quest games but by the time I had finished with the fourth, Perils of Rosella, I'd had enough. I don't remember if I knew it at the time, or if it actually took the arrival of KQ5, Absence Makes the Heart Go Yonder, to make me realize that I had no interest, but when it finally came around I did not care one whit—I don't think I even bothered trying it. The KQ games were great in their day but they never grew out of it, and between that and the way I kind of overdosed on Sierra adventures when I first started playing them (I played the holy hell out of Space Quest, Police Quest, Leisure Suit Larry, and most of the rest, too), I've never felt an urge to go back. For some reason I have lost most of my enthusiasm for Assassin's Creed. Even with a two-year break and a mostly successful revamp in Origins, the notion of going into a new 100-hour adventure and having to rediscover wristblades and start all over again with a new assassin is wearying. It's unfair too, given how much effort goes into making the historical setting of each game so beautiful and different. What I'm really tired of is the fundamentals like running, jumping and fighting, which haven't felt fun and responsive to me in those games for years. I would rather go back to the pistol carnage of Black Flag than spend 50 hours moving up through Origin's leveling system. Hopefully the newly revealed Assassin's Creed Odyssey can make some exciting changes. Resident Evil 7 was great, the perfect soft reset for the series that relied on a small cast of interesting characters rather than zombies to scare us. I guess I should walk that back a touch. The first third of Resident Evil 7 was great, but then the zombie stand-ins showed up, the hilarious and spooky Baker family fell to the wayside, and RE7 became a generic monster shooter with light puzzle-solving. I was feeling especially defeated during the short train of cameos during the final moments. Chris Redfield shows up, a Wesker gun saves the day, and whadda you know? It's the same convoluted Resident Evil nonsense I'd been hoping the series had left behind for good. Damnit, Capcom! I've never been chased through a mansion by a middle-aged man in a swamp before! But RE7 spends its final six or so hours taking you further and further away from the dream. If early Resident Evil 8 trailers even hint at Umbrella, zombies, or ropes in an old character, I'm out until someone can convince me otherwise. I had several "go to" series growing up, Ultima, Might and Magic, and Wizardry. Ultima and Wizardry suffered ignominious deaths at the hands of the developers, and Might and Magic was basically dead until a tenth installment arrived (twelve years after the previous title) in 2014. I loved Might and Magic III through V, but never quite felt lake the later editions kept up with the times. MM6: Mandate of Heaven was the last game in the series I played more than a few hours, and I never even tried MM8 through MM10. Heroes of Might and Magic took a similar trajectory, in that I thought one through three were great, and four and beyond couldn't keep my interest. That's the sad reality of getting older and more responsible, perhaps. After staying up until 6am far too many times with HOMM3, I finished school, got a real job, and pulling an all-nighter on a game was no longer something I wanted to do. I have no idea if the later versions are any good. Sorry Might and Magic. It's not you, it's me.